Our galaxy is filled with billions of red dwarf stars, all of which are too dim to see with the naked eye. Lying at the faint, red end of the Hertzsprung-Russell diagram, their small masses -- a few tenths that of the Sun -- make them much cooler and dimmer than our own Sun. In fact, few of these stars have been detected beyond a dozen or so parsecs of our solar system. However, some of these stars belong to the spectacular class of variables known as the flare stars or the UV Ceti variables. At irregular and unpredictable intervals, they can dramatically increase in brightness over a broad wavelength range from X-rays to radio waves for anywhere from a few minutes to a few hours. The fact that such small, unassuming stars can suddenly undergo incredibly energetic events make the flare stars one of the more intriguing targets for variable star observers. Although flare stars may have been detected as early as 1924, the earliest confirmed observations are attributed to W.J. Luyten, who discovered strongly variable spectra in two high proper-motion dwarf stars now known as V1396 Cyg and AT Mic. In particular, Luyten noted that the emission lines of hydrogen were first observed in a very bright state, but then rapidly faded. Several similar stars were found in short order: V371 Ori, WX UMa, YZ CMi, and DO Cep were all discovered in the late 1930's and early 1940's. However, the field of flare star research really took off with the discovery of flares on Luyten 726-8, another high proper-motion binary, in September of 1948 (Joy & Humason 1949). Astronomers observing this star at Mount Wilson discovered a huge increase in brightness over a very short time. Later analysis of the spectra taken during the observation revealed a change in brightness of over four magnitudes, and a rise in effective temperature to well over 10,000 K. These incredible changes faded just as rapidly, with the star returning to its cool, quiescent state in less than a day. Today, the star is known as UV Ceti, the class prototype for the flare stars. Since their initial detection and characterization in visible light, the UV Ceti stars have also been detected over a wide wavelength range, from X-rays to radio. The coincidence between radio and optical flaring in the UV Ceti stars was noticed as early as 1966 (Lovell & Solomon), and X-ray flares were first detected in 1975 (Heise et al.). Many multiwavelength campaigns have been conducted on various flare stars, and as a result, we now have a reasonably good physical picture of how flares work. The number of known flare stars is also increasing with time: the GCVS currently lists 1620 stars of UV Ceti (UV) or UV Ceti + Nebular (UVN) type. Recently, variable emission lines have been detected in young brown dwarf stars (Liebert 2003), raising the exciting possibility that brown dwarfs may also exhibit flaring activity. As a class, the known flare stars have spectral types of late M through late-K, corresponding to temperatures between about 2500 to 4000 K. Often, they have detectable emission lines of hydrogen and calcium in their spectra, indicating chromospheric activity. They have masses between 0.1 and 0.6 times that of the Sun; some brown dwarfs may exhibit flaring activity, though the study of these stars is still very much in its infancy. Many of the known flare stars are members of young stellar associations (e.g. the Orion and Taurus star-forming regions), though some older flare stars are known. Many are also known to be binary stars, and this may correspond to an increased likelihood of activity. Some of the UV Ceti flare stars are also members of the BY Draconis class of spotted variables. 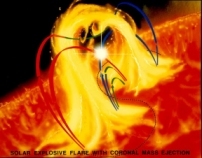 Figure 2: Schematic diagram of a solar flare. Red and blue lines represent magnetic fields, carrying solar material off the surface. Flares occur when these field lines meet and "reconnect", producing huge explosions, and heating and acceleration of solar material. Credit: NASA Marshall Space Flight Center. Variability in the flare stars is characterized by rapid, irregular, large-amplitude increases in stellar brightness, followed by a much slower decay (from minutes to hours) back to a quiescent level. The strongest variations occur in the blue end of the optical spectrum: a flare may cause a one-magnitude change in brightness in the V-band, but five magnitudes in the U-band. Flares are typically accompanied by brightening of the emission line spectra of the star, particularly of the Balmer series of hydrogen, and the appearance of ionized helium lines as well. Flares have also been observed in the radio and X-ray regions of the spectrum, though they are not necessarily coincident with optical flares. It is now believed that flares on the UV Ceti stars are analogous to solar flares in nearly all respects. On the Sun, flares are caused by the sudden release of magnetic energy via magnetic reconnection events. The solar photosphere is threaded with magnetic fields that move and change in strength over time. 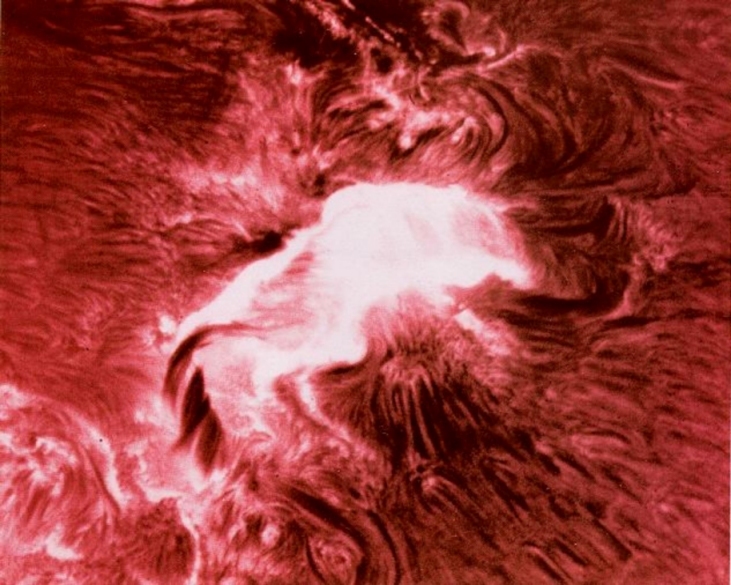 Solar material and the magnetic fields are coupled together, and one of the effects of this can be sunspots. In sunspots, the magnetic field prevents convection which transports heat from the interior to the surface -- when the heat transfer is blocked, material at the surface cools down. Another effect of this coupling can be a solar flare -- if the magnetic field can rearrange itself to a lower-energy configuration, the excess energy gets transferred to the plasma within and around the magnetic field. When this happens, the solar plasma is rapidly heated, and can even be accelerated to relativistic speeds. The super-heated plasma radiates vigorously in ultraviolet (and even X-ray) light, producing a flare -- a rapid spike in brightness. In addition to thermal heating, particle acceleration also results in the emission of non-thermal radiation, including gamma-rays from collision-induced nuclear reactions. As the gas cools and the energetic particles dissipate, the brightness of the flare decays with an exponential timescale. Similar things are believed to happen on flare stars, with a few important differences. One difference is that flare stars are intrinsically faint in visible light, particularly at shorter wavelengths. Thus the flare drastically raises the ultraviolet-blue continuum of the star, along with emission lines atypical of cool stars (like ionized helium). Another difference is that the absolute sizes of flares on flare stars may be a significant fraction of the size of the star itself (perhaps as much as one fifth of the circumference!) rather than being limited to a few thousand kilometers as on the Sun. These two things combine to cause very large luminosity changes in the flare stars, particularly in the blue end of the spectrum. The flare stars are known to be bright at X-ray (Figure 4) and radio wavelengths as well. The physics of flare star radio flares are likely the same as those on the Sun: a magnetic event accelerates charged particles that interact with magnetic fields to produce cyclotron and synchrotron radiation. X-ray flares have also been observed, but the flare stars are also known to have very large quiescent X-ray luminosities, most likely from a large, bright corona. Their X-ray luminosities can be on the order of one percent of the total bolometric luminosity -- far, far greater than would be expected for a low-mass, non-interacting star. Figure 5: Flare on UV Ceti, observed by T. Cragg (CR), January 23, 1959. The flare stars have been a part of the AAVSO observing program for nearly as long as the stars have been known. The earliest observations of UV Ceti in the AAVSO International Database date to January of 1950, less than 18 months since its discovery in late 1948. Observations commenced on several other stars in the early and mid-1950's. One of the earliest high time-resolution lightcurves of a flare was made by Thomas Cragg on November 14, 1952. Cragg caught UV Ceti in the midst of a flare (mvis = 10.4), and made observations once every few minutes until the star faded to its quiescent level (mvis = 12.2). 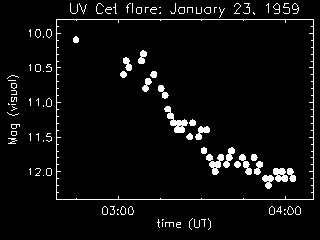 He recorded another flare in UV Ceti on January 23, 1959, shown in Figure 5. Many other flares have been caught and followed by AAVSO observers since then, both in UV Ceti and in other flare stars, like EV Lac and V371 Ori. 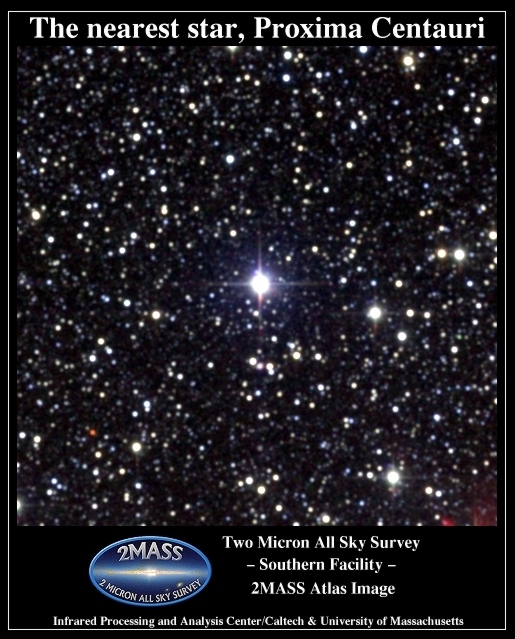 Flare stars have also been subject to collaborative efforts between the AAVSO community and professional astronomers, particularly for the purpose of multiwavelength campaigns. 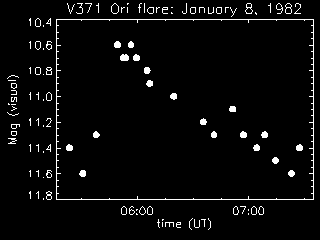 Figure 6: Flare on V371 Ori, observed by L. Cook (COO), January 8, 1982. The morphology of a flare event you are likely to see is much like the January 7-8, 1982 flare of V371 Ori (observed by Lew Cook) shown in Figure 6. The star will brighten from its quiescent level by (up to) a few magnitudes over the space of just a few minutes. After the peak is reached the visible light fades back to quiescence over a period of tens of minutes to a few hours. Depending upon the strength of the flare and the color sensitivity of the observer, the peak brightness may be between one and several magnitudes above the quiescent level. Flare stars can undergo much smaller flares of a few tenths of a magnitude or less, though these may be difficult to measure by visual observers. Sometimes, the star may reach a plateau, superimposed with several short flares -- the high point near 06:50 in Figure 6 may be an example of such a flare. The flare stars spend relatively little time at their brightest -- perhaps a few minutes per flare -- and the occurrences of flares are unpredictable. Therefore, flares are difficult to catch. The best way to observe one is to devote one night to a single flare star, and monitor it once every few minutes, much like one would observe a short-period eclipsing binary. In the ideal (but unlikely) case, these observations would allow you to catch the quiescent pre-flare brightness level, the rapid rise of a flare, and its decay to quiescence. Unfortunately, flares are unpredictable, so it may be awhile before you catch a flare star in the act. Flare stars are ideally suited to CCD and (especially) photoelectric observations because of the high time-resolution needed to catch all phases of the flare, and photomultipliers have the additional benefit of being very blue-sensitive. If you are using a CCD or photomultiplier, U, B, or V filters or their equivalent are recommended, since the flare amplitudes are larger at bluer wavelengths. However, many flare events have been detected by visual observers (including the two shown above), so persistent visual observers should have no problem observing flare stars. Observe the star once every few minutes, and determine whether the brightness has changed. If so, record the time and magnitude. If not, observe again in five minutes. If you notice a very large increase in brightness, record the time and magnitude, and try to increase the frequency at which you make observations. If no change in brightness is noticed by the end of your observations, report the start and end times of your observing run, and indicate "NO FLARES" in the notes. Many of the flare stars were first discovered during studies of high proper motion stars, and some have proper motions of several arcseconds per year. Because of this, many of the charts for flare stars are out of date, especially those made during the 1960's and 1970's. We are in the process of generating new charts for these objects, but until they are available, we have assembled "blinking" images from the first and second editions of the Digital Sky Survey, with the time between images ranging between seven years (V371 Ori) and 43 years (AD Leo). You can use the blinking images to help you estimate the position of the star in the current field. The blinking images may be found here, and DSS2 images (ca. 1997) indicating the star's current position may be viewed individually through the following links: WX UMa, UV Cet, EV Lac, AD Leo, YZ CMi, and V371 Ori. All images are 30 arcminutes on a side, and the flare star is located within the square aperture in the static DSS2 images. The approximate direction of the proper motion (if any) is indicated with an arrow. We recommend that you use the blinking images and the existing AAVSO charts together -- use the blinking images as finder charts to determine the current position of the variable star, and the AAVSO chart for the sequence. This Variable Star of the Season was prepared by Dr. Matthew Templeton, AAVSO.